The Bose QuietComfort 35 Series II Wireless Headphones are fantastic, but they’re also pretty expensive. If you’re in the market for your first pair of high-end headphones or if you’re moving over to Bose from another brand, they’re definitely worth the expense. But if you have an older pair of wired Bose headphones, there’s another option that you should definitely consider. 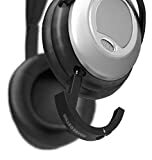 The AirMod Wireless Bluetooth Adapter for Bose QuietComfort 25 Headphones and AirMod Wireless Bluetooth Adapter for Bose QuietComfort 15 Headphones are tiny little adapters that attach to your wired Bose headphones and instantly transform them into Bluetooth headphones. They blend in and look like an original part of your headphones, and they’re $59 on Amazon instead of $350 like the QC35s.